Fifth Third Bancorp is a diversified financial services company headquartered in Cincinnati, Ohio. As of June 30, 2017, the Company had $141 billion in assets and operated 1,157 full-service Banking Centers and 2,461 ATMs in Ohio, Kentucky, Indiana, Michigan, Illinois, Florida, Tennessee, West Virginia, Georgiaand North Carolina. 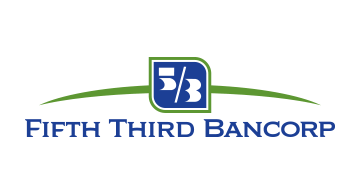 Fifth Third operates four main businesses: Commercial Banking, Branch Banking, Consumer Lending, and Wealth & Asset Management. As of June 30, 2017, Fifth Third also had a 17.7 percent interest in Vantiv Holding, LLC. Fifth Third is among the largest money managers in the Midwest and, as of June 30, 2017, had $330 billion in assets under care, of which it managed $34 billion for individuals, corporations and not-for-profit organizations through its Trust, Brokerage and Insurance businesses. Investor information and press releases can be viewed at www.53.com. Fifth Third's common stock is traded on the Nasdaq® Global Select Market under the symbol "FITB." Fifth Third Bank was established in 1858. Member FDIC, Equal Housing Lender.